Food, our need for it is primal, but our relationship with it is complex and eve﻿rchanging. For many in the UK and elsewhere in the developed world, eating has become a leisure pursuit, and cooking a hobby. But our bodies are still hard-wired for a tougher world where food means survival. Our sense of taste, for example, evolved to be a front‐line defence against toxins and a sensor to help detect the most energy‐rich fare. However, our innate craving for sweets and fats, and their ubiquitous availability, now seems to be leading us down a path of bodily destruction. Because food is packed full of complex, biologically active molecules, the fact it has an impact on our health is no surprise. Yet, teasing apart the effects of each component on the body is a difficult task, and one that will continue for many years to come. Some people predict an age of diets customised to individual energy needs and disease susceptibility. But no matter how good the science, or how well we are able to exploit food as an agent of healthfulness, we will still be eating with mainly pleasure in mind for some time yet. Eating for both health and pleasure is, for some, not achievable at the same time. Striking a balance is sometimes very difficult, fraught with complications, and possibly confused by marketing messages from food manufacturers. As a nutritional therapist, I will guide, encourage and support you through your journey towards optimal health and peak condition. Like Hippocrates, I am passionate about food as Medicine. As a Chemist and Nutritional Therapist I can help you turn you or your child’s health around using the latest research in nutritional supplements and by manipulating food components in your diet. 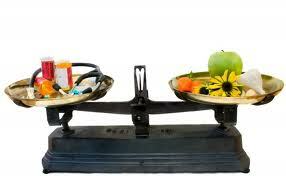 I balance science and nutrition to help your body restore its optimum function. Drugs are not the only answer and some may actually inhibit the body’s own natural healing mechanisms.